Before he became a Republican senator from California, George Murphy hunted communist spies in Boston in Walk East on Beacon (dir. Alfred L. Werker, based on an article by J. Edgar Hoover). McGerr's Selena Mead: An almost-series. Television Obscurities discusses the abortive effort to feature Patricia McGerr's spy Selena Mead in a TV series, including interest by Polly Bergen and Shirley MacLaine's then-husband Steve Parker. Readers can become acquainted with Mead in the Nov. 1964 story "Campaign Fever." More work of McGerr (1917–85) is on display in the May 1983 episode "Where's Your Sense of Humour?" from Tales of the Unexpected (based on a McGerr story). Reddy receives 2013 Dove Award. 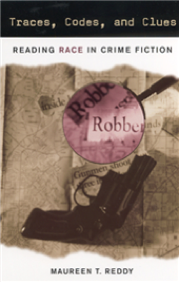 Maureen Reddy (Rhode Island College) is this year's recipient of the George N. Dove Award from the Detective/Mystery Caucus of the Popular Culture Association for contributions to the serious study of mystery/crime fiction. Reddy is the author of Traces, Codes, and Clues: Reading Race in Crime Fiction and Sisters in Crime: Feminism and the Crime Novel, among other works. Past recipients of the Dove Award include Frankie Y. Bailey, Douglas G. Greene, the late H. R. F. Keating, P. D. James, Catherine Ross Nickerson, and yours truly. Evelyn Waugh: Perry Mason fan. • A piece by Linda Kelly on detective fiction that discusses Evelyn Waugh's fondness for Perry Mason, his letter to Mason creator Erle Stanley Gardner, and Gardner's reply. (See also Alfred Borrello's article "Evelyn Waugh and Erle Stanley Gardner" from the winter 1970 Evelyn Waugh Newsletter.) In the web of relationships, Waugh was a cousin of mystery novelist Sarah Caudwell. • P. D. James and Ruth Rendell on mystery writing after Agatha Christie. Among other topics, James discusses the road to publication for Cover Her Face, indicating that it started with meeting actor-writer Miles Malleson (a cousin of Lucy Beatrice Malleson, aka mystery author Anthony Gilbert). • A discussion (on audio) with Daphne Park (MI6 operative and principal of Somerville College, Oxford), including readings from Ian Fleming's work by Lucy Fleming (his niece). Robert Vaughn (still playing Napoleon Solo on Man from U.N.C.L.E. at the time) tries to figure out why a US diplomat detonated a bomb at a peace conference in this adaptation of Helen MacInnes's spy novel (Kirkus review here). The film costars Boris Karloff, Elke Sommer, and Felicia Farr. 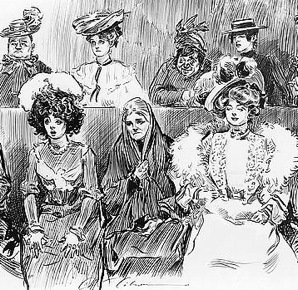 Artist Charles Dana Gibson on female jurors. Detail from "When Women Are Jurors"
by Charles Dana Gibson (1902). LOC. Included in the Library of Congress exhibition "The Gibson Girl's America: Drawings by Charles Dana Gibson" (on view until August 17, 2013, but some images are online) are Gibson's illustrations for Life, "When Women Are Jurors" (1902) and "Called for Jury Duty" (1927). One of the most popular posts on The Bunburyist is the one on female juries, which perhaps indicates keen interest in this topic. Celebrating 50 years of The Birds. On March 30, the History Show of RTE (Ireland) marked the 50th anniversary of the premiere of Alfred Hitchcock's film The Birds. Below, The Birds' screenwriter, Evan Hunter, talks about the original ending of the film. Warner Instant Archive and film noir. 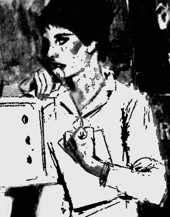 de la Torre's "The Older Sister" (1956). A female reporter pursues an interview with the reluctant sister of Lizzie Borden in the Alfred Hitchcock Presents episode "The Older Sister." Carmen Mathews plays Lizzie, and Patricia Hitchcock (daughter of Alfred) plays the servant Margaret. The episode is adapted from the play Goodbye, Miss Lizzie Borden (Suspense radio version, 1955) by Haycraft-Queen author and Edgar nominee Lillian de la Torre McCue (1902–93), who was known for her portrayal of Dr. Samuel Johnson as a master sleuth. Clues 31.1: Hitchcock and adaptation. 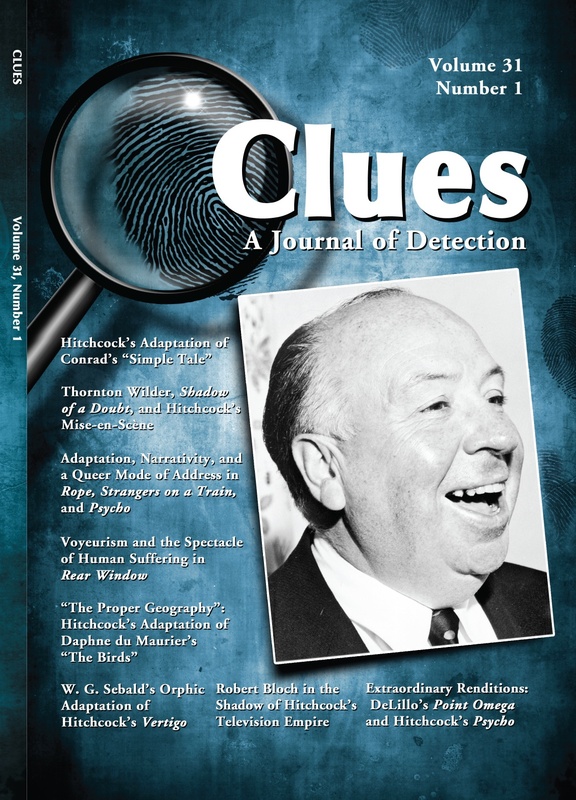 "Hitchcock and Adaptation" is the theme of Clues 31.1 (2013), guest edited by Loyola Univ Maryland's Mark Osteen (author of Nightmare Alley: Film Noir and the American Dream). 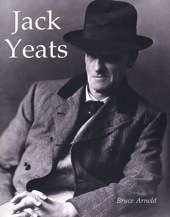 The following is a summary of the contents (with links on the article titles). To order the issue or subscribe to Clues, visit this Web page or download the subscription flyer. "Inspiring Public Uneasiness": Hitchcock's Adaptation of Conrad's "Simple Tale." MATTHEW PAUL CARLSON (High Point Univ, NC) In Alfred Hitchcock’s Sabotage (1936; adapted from Joseph Conrad’s The Secret Agent, 1907), the director goes beyond mere use of the novel as a point of departure; he deeply engages its underlying anxieties about the artist’s relationship to his audience. Reading Hitchcock/Reading Queer: Adaptation, Narrativity, and a Queer Mode of Address in Rope, Strangers on a Train, and Psycho. HEATH A. DIEHL (Bowling Green State Univ) Alfred Hitchcock’s Rope (1948) and Strangers on a Train (1951) reveal an interest in the odd; the peculiar; the “queer.” The author examines the narrative choices made in adaptation. "Dear Miss Lonelyhearts": Voyeurism and the Spectacle of Human Suffering in Rear Window. NICHOLAS ANDREW MILLER (Loyola Univ Maryland) Rear Window offers a powerful meditation on the ethical implications of private voyeurism in the public sphere. The ﬁlm draws thematic inspiration from Nathanael West’s Miss Lonelyhearts. "The Proper Geography": Hitchcock's Adaptation of Daphne du Maurier's "The Birds." JOHN BRUNS (College of Charleston) Alfred Hitchcock’s adaptation of Daphne du Maurier’s “The Birds” illuminates the technical aspects of his process of adaptation, much-ignored similarities between du Maurier’s text and Hitchcock’s ﬁlm, and the anxiogenics of spatial dislocation. Hitchcock's Diegetic Imagination: Thornton Wilder, Shadow of a Doubt, and Hitchcock's Mise-en-Scene. DONNA KORNHABER (UT-Austin) The author considers the collaboration between Thornton Wilder and Alfred Hitchcock on Shadow of a Doubt (1943) and examines the inﬂuence of Wilder’s theories of theatrical abstraction and cinematic realism on Hitchcock’s developing sense of mise-en-scène. Adapting Poe, Adapting Hitchcock: Robert Bloch in the Shadow of Hitchcock's Television Empire. 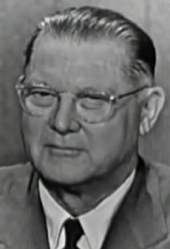 DENNIS R. PERRY and CARL H. SEDERHOLM (both Brigham Young Univ) Alfred Hitchcock’s television programs challenged adaptors to transfer his style and persona to the small screen. Robert Bloch invoked his own and Hitchcock’s deep interest in Poe to create episodes that tended to be more dark, ironic, and psychologically edgy than others. Extraordinary Renditions: DeLillo's Point Omega and Hitchcock's Psycho. MARK OSTEEN Tracing how Don DeLillo’s novella rings changes on the word rendition, the author unravels a skein of intertextual and metacinematic relations that stretches from Psycho to Douglas Gordon’s 24 Hour Psycho video installation, Robert Bloch’s original novel, and the many Psycho remakes. The episode "Bridge for Sale: Deception in America" (mostly on confidence men) of the history radio program BackStory featured a few mystery elements during the discussion of the lie detector. In addition to covering Wonder Woman's golden lasso, the program included an excerpt from the mystery novel The Yellow Circle (1909) that posited the creation of a lie detector device; the author is Charles Edmonds Walk (1875–1943), who also wrote The Paternoster Ruby (1910). "Bridge for Sale" also mentioned the film Call Northside 777 (1948, dir. Henry Hathaway), in which reporter Jimmy Stewart attempts to exonerate an accused cop killer; a real-life developer of the polygraph, Leonarde Keeler, appears in the film as, appropriately enough, a polygraph examiner. British comics exhibition (incl Holmes spoof). Among the fascinating images in the University of Oldenburg library's online exhibition "Wonderfully Vulgar: British Comics 1873–1939" are two pages from Arthur Conan Doyle's "The Adventure of the Greek Interpreter" in the Strand (illus. Sidney Paget) and the 1897 spoof The Funny Wonder featuring "Chubblock Homes" drawn by Jack Butler Yeats (the artist brother of W. B. Yeats; see also Chubblock's appearance in drag). There's also an excerpt from a 1936 sea serial starring James Cagney. British Lib podcast: The Female Detective. 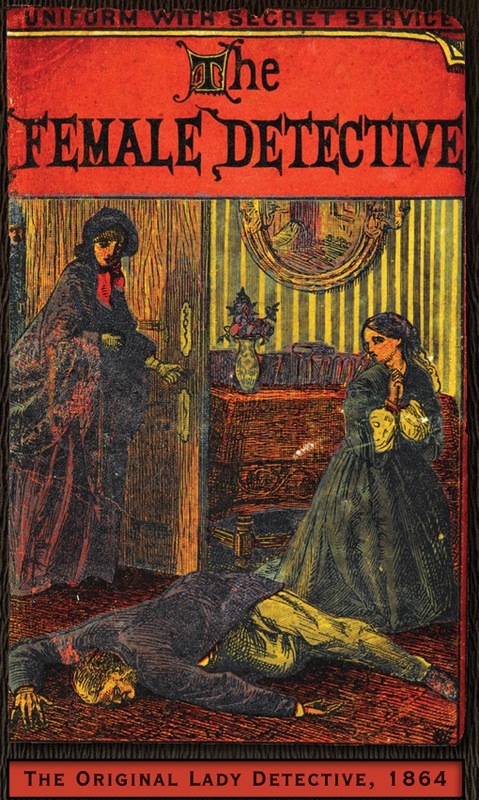 The British Library has just posted the podcast from the panel that discussed the female detective from the debut of "Miss G" in Andrew Forrester's The Female Detective in 1864. Held in conjunction with the exhibition "Murder in the Library," the event featured Lindsey Davis, Natasha Cooper, The Killing producer Piv Bernth, and former Clues executive editor Margaret Kinsman. Agatha Christie's "Philomel Cottage," in which a wife suspects her new husband of sinister intentions, has been adapted several times. These include a 1937 film (also known as A Night of Terror; see below) with Ann Harding and Basil Rathbone and a 1947 film with stars John Hodiak, Sylvia Sidney, and John Howard, and a screenplay by Philip MacDonald (The List of Adrian Messenger, etc.). Other versions include a play by Frank Vosper and the October 1943 Suspense episode with Orson Welles and Geraldine Fitzgerald. Play version of The Turn of the Screw. Henry James's The Turn of the Screw just closed at London's Almeida Theatre (produced in cooperation with Hammer Films), but you can watch the following trailer for the production with Gemma Jones.